Tripp Lite's line of AC power cords offer PC users a solution to their power connectivity problems. This 3.66 m (12-ft.) cable will replace the power cable on most computers and peripherals that have a removable power cord. Cable features an AC style plug (NEMA 5-15P) on one end and a computer style receptacle (IEC-320-C13) on the other end. UL Listed. 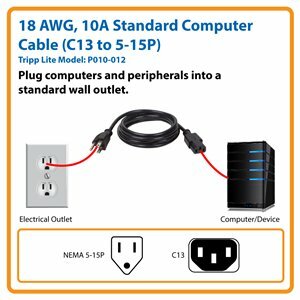 Tripp Lite’s P010-012 12-foot, Standard Power Cord is an ideal power connection solution for PCs and peripheral devices containing a C14 input. With a NEMA 5-15P connector on one end and a C13 connector on the other, this 18 AWG, 10A cable powers most computers and printers, as well as many other types of network devices and peripherals. Simply connect the C13 end to your device and the NEMA 5-15P end to a UPS, PDU, surge protector or AC wall outlet. Unlike cut-price power cords, the P010-012 is manufactured using superior materials and is tested to UL standard 817 for optimal product safety. The high-quality connectors are designed for reliable service and long life. This SJT cable has three 18 AWG conductors and is rated 10 amps. For peace of mind, the P010-012 comes with a lifetime warranty. As part of Tripp Lite’s commitment to environmental responsibility, the P010-012 minimizes the use of hazardous materials and meets strict RoHS specifications.